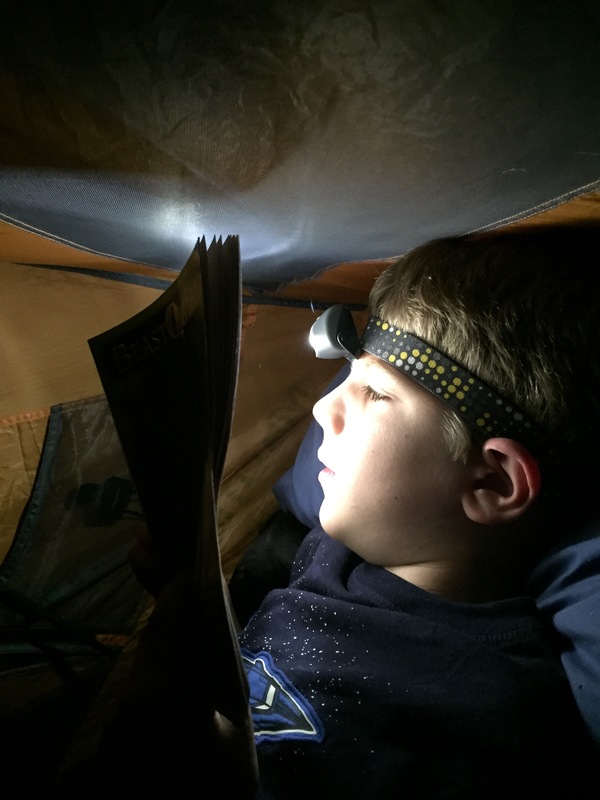 I have taken my nephew camping since he was 3 – we started out camping in my sisters backyard. Then camped in my back yard. 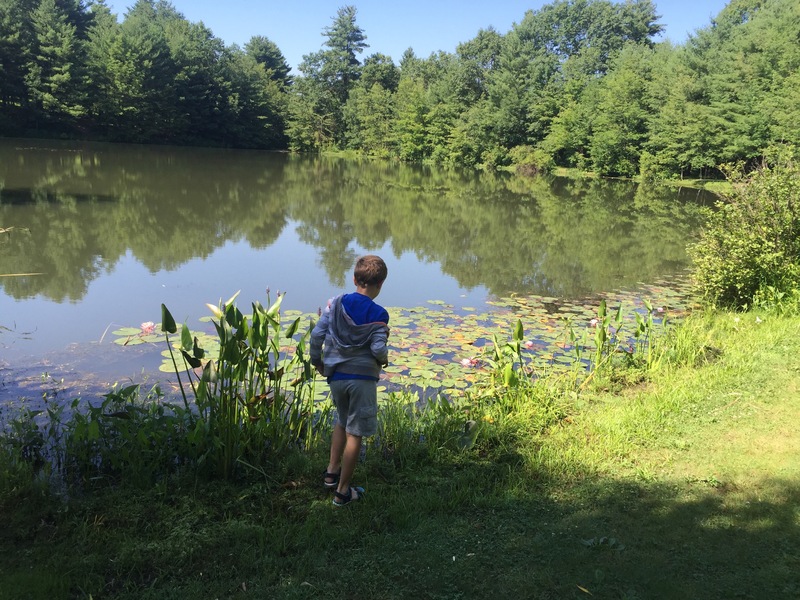 Then he said he wanted to camp in the “deep deep woods” so we spent the night at French Creek State Park. He LOVED IT! 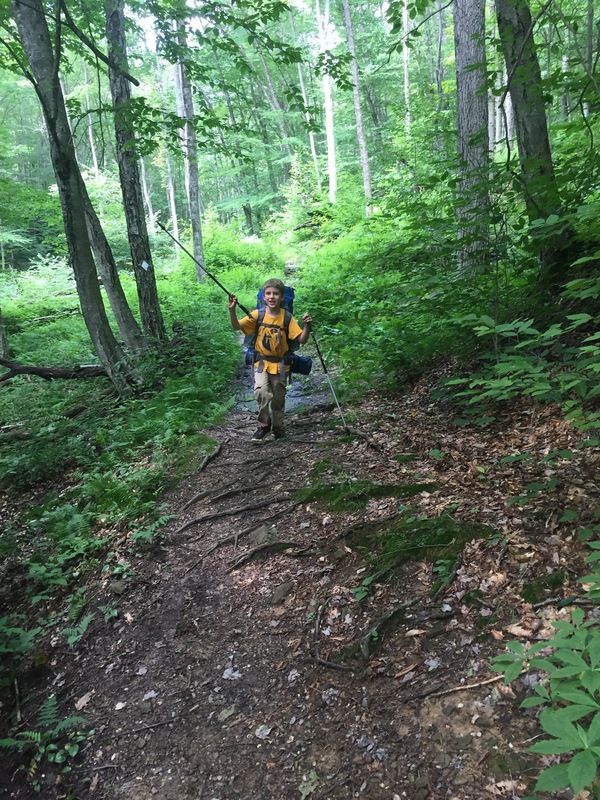 When we pulled into our camp site a few wild turkeys were walking around near the fire ring – it was so awesome, but they wandered off fairly quickly. We got the tent set up, made a fire and had a little dinner. He was fascinated by the bathhouse – I remember he went to EVERY stall and pushed on the door and was shocked that there were toilets in all of them. I told him to stand outside the stall so I could see his legs while I went to the bathroom – there were a few other people in the bathhouse drying their hair and brushing their teeth and stuff. I hear my nephew shout “WHO LET THESE SPIDERS IN THIS HOUSE? ?” I start cracking up laughing – my sister (his mom) is a bit of a neat freak and also his parents are not outdoorsy at all. I say “It’s ok, we’re camping so there’s gonna be spiders and bugs! !” We made some smores – I made the HUGE mistake of letting him eat as many marshmallows as he wanted. OOPS! He had a HUGE bellyache and I felt horrible! 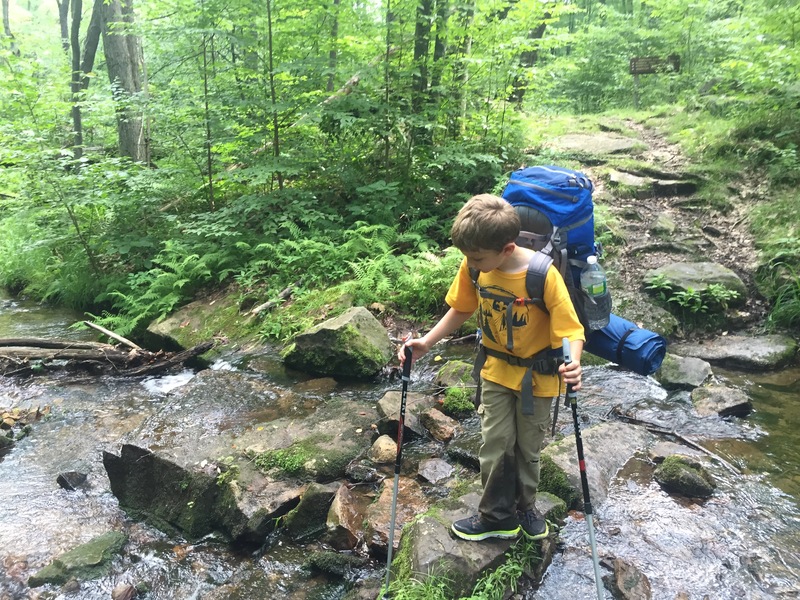 Now that he’s 7 I decided to take him into the REAL “deep deep woods” in early July- a backpacking adventure!! 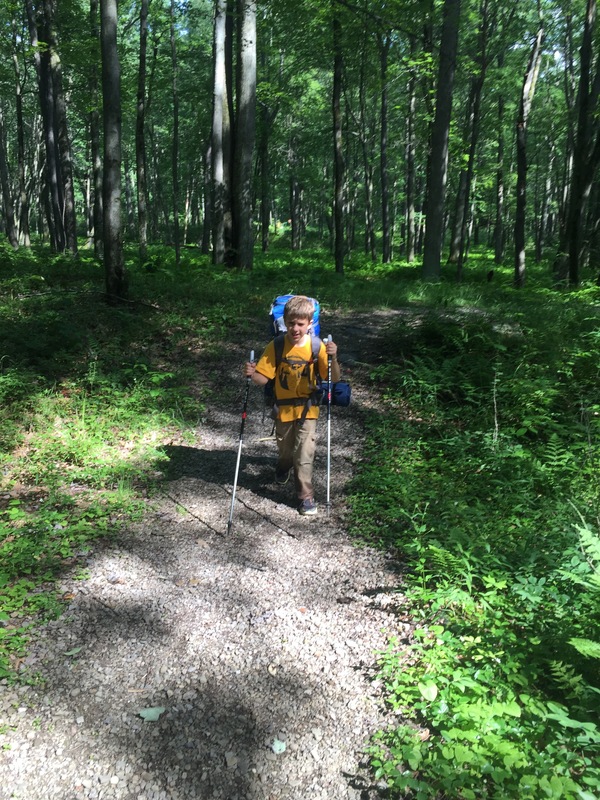 I chose the Morrison trail as there were a few places to camp before you get to the reservoir in case he got too tired to continue and there was supposed to be waterfalls and cool giant boulders along the way. 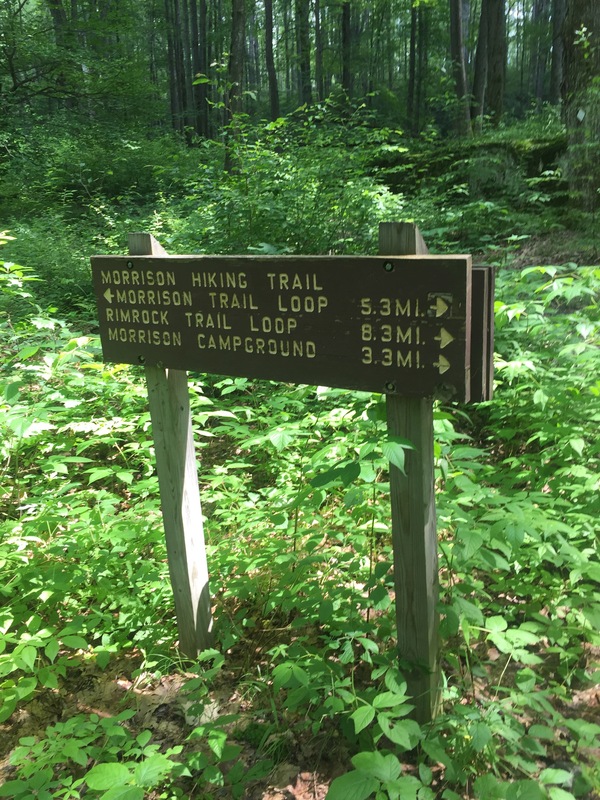 The Morrison Trail in Allegheny National Forest is supposed to be fairly easy as well so I figured we could handle it! 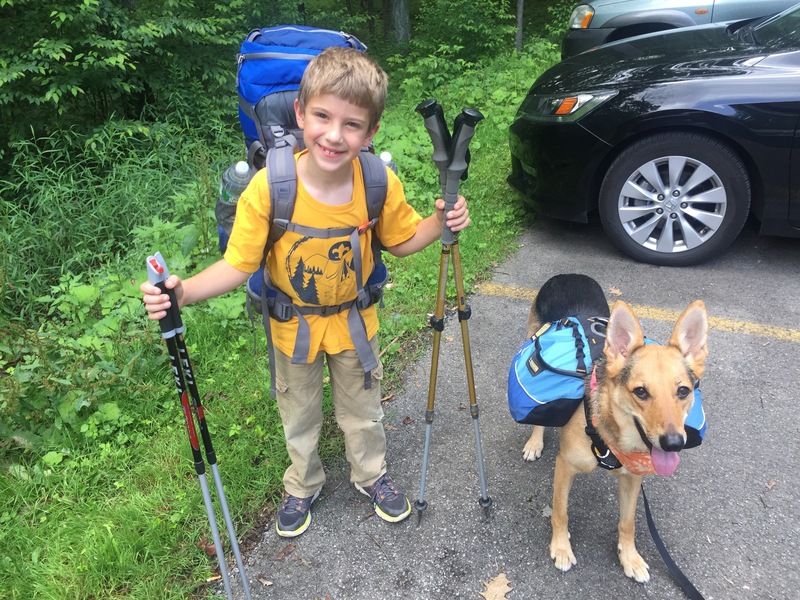 Of course I decided to bring JoJo along – am I nuts to bring a hyper kid and a hyper dog backpacking?? 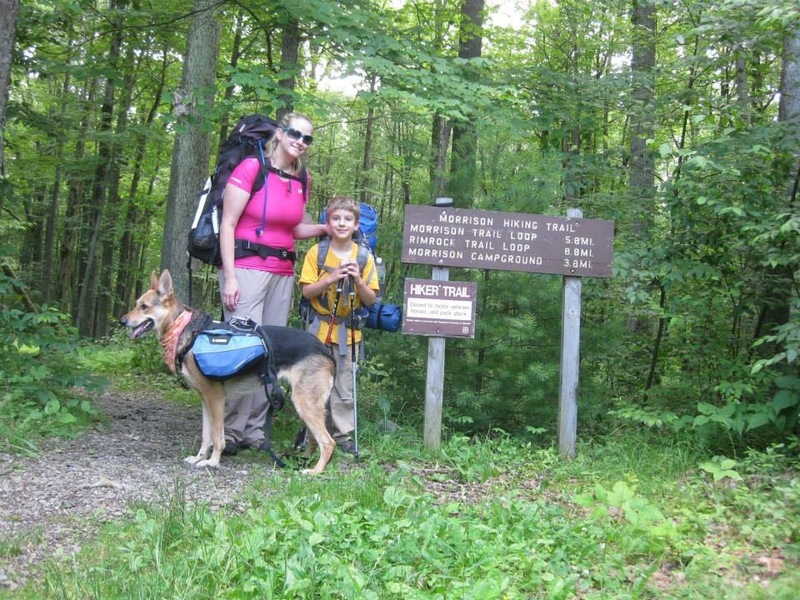 The drive was LONG to western PA, we found the trailhead easily and got out to get our things together. There was a vault toilet in the parking lot – I was a little scared of this because I wasn’t sure exactly what that meant, but it was surprisingly clean and didn’t smell terrible. 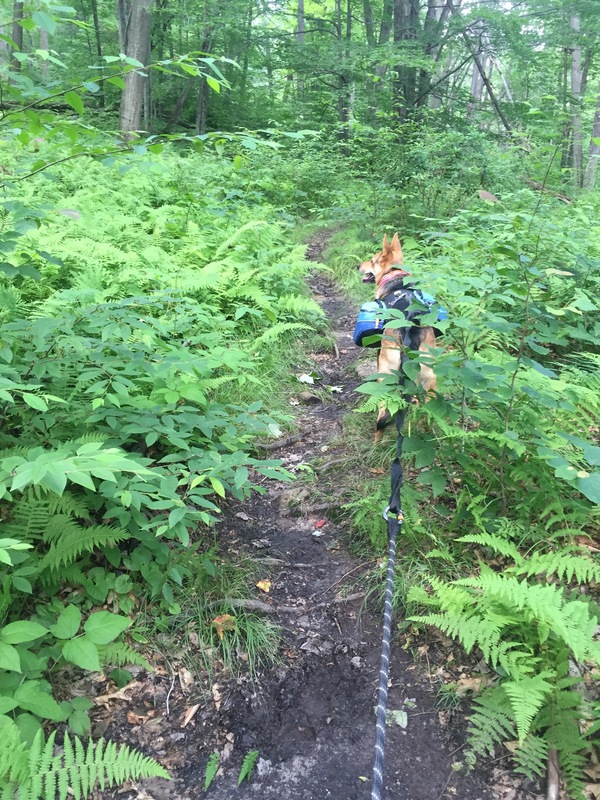 Well, let me tell you, the trail was downhill slightly and the further we went, the muddier it got – and also there were parts that the brush had grown into the trail – not that it was hard to see, but it was a little tough getting through. 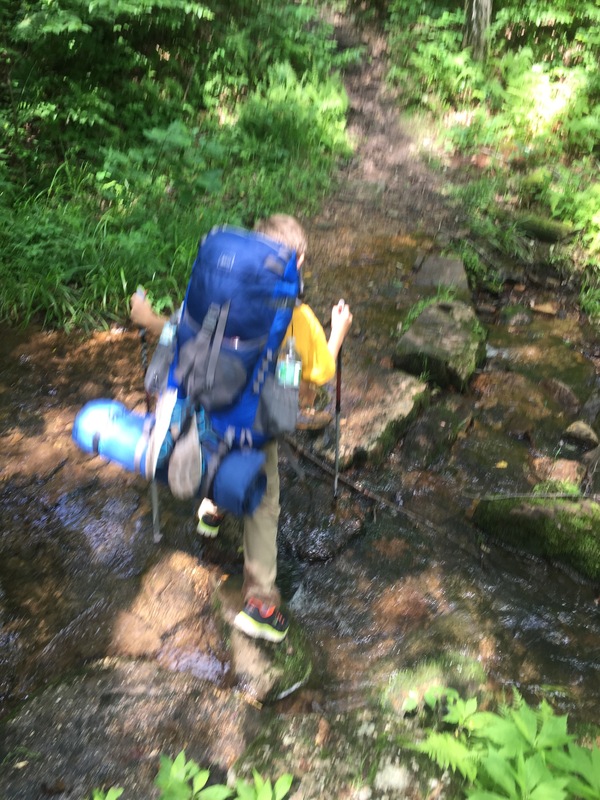 At one point there was a little stream crossing and I turned around to tell my nephew to follow me and stay on the rocks so his feet won’t get wet only to see him SLOSH right through, splashing in the water! 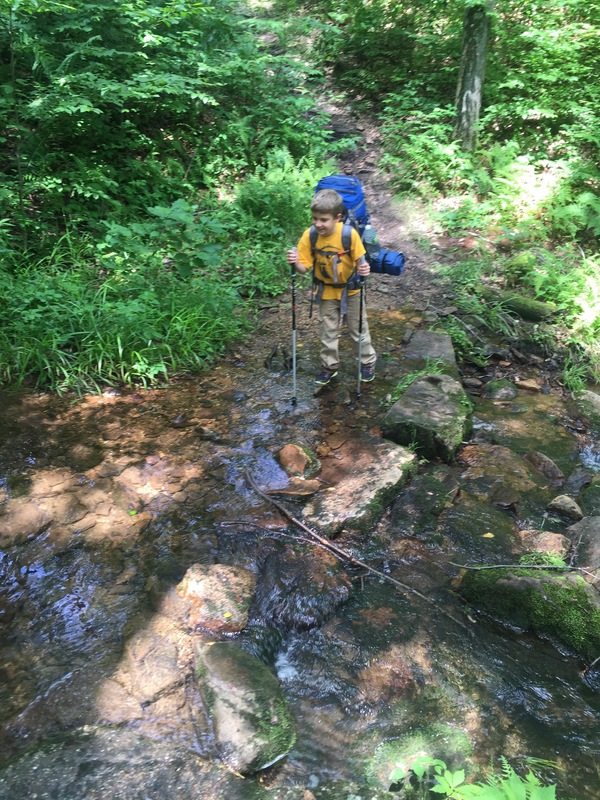 I was laughing, even though I was worried that now his feet and socks were soaked, and I told him to try to stick to the rocks from now on. I was worried that we would get all the way to the reservoir (our planned campsite) and there would be no place to set up the tent due to the mud and puddles of water. As we continued down the trail and it progressively got worse I said “I think we may need to turn around – we are hiking downhill and the further we go, that’s how far we have to hike out if there’s no place to camp.” He kept saying “Lets just go a little further and see how it is.” So we would go a little further and it would get muddier – we made it about 2 miles and I said “I really am worried we are gonna get all the way down there and there will be no place to camp. I think we should turn around. I promise we will find a campsite somewhere else! 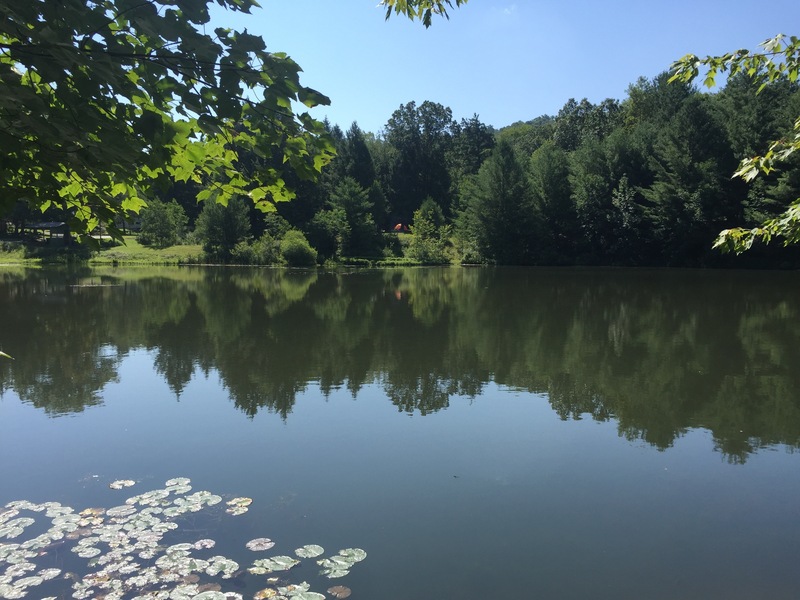 !” He seemed a little bummed out – I was too honestly, but I had never been to this area before so I didn’t know what to expect – it had CLEARLY rained way more than I thought it did. 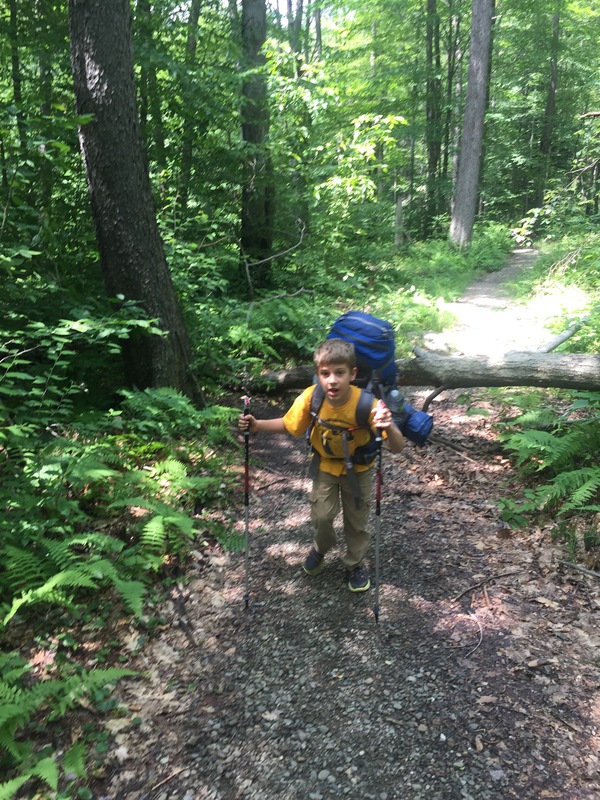 If we would have made it the whole way and had to turn around and hike back to the car it would have been an 8 mile hike – way too much for him on his 1st trip—and me who was carrying most of the gear. We reluctantly turned around and started hiking back. 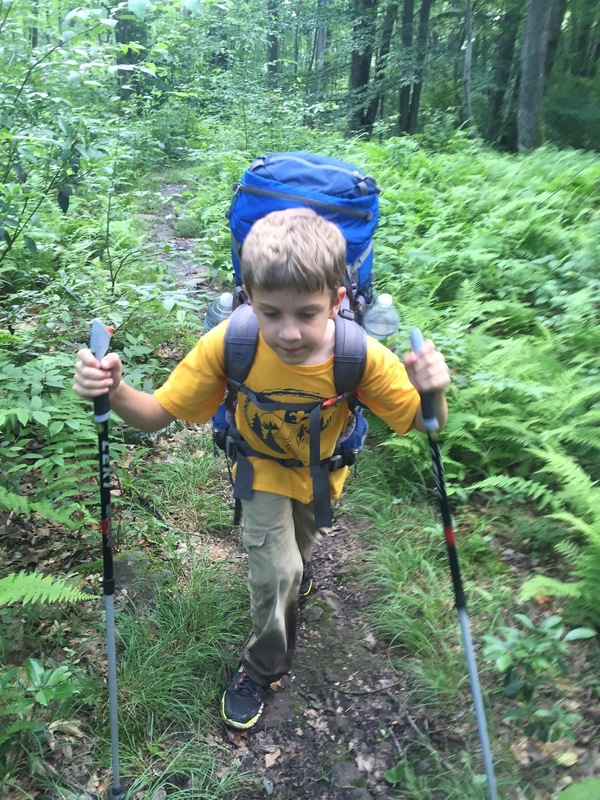 I could tell his spirits were down a little and it was slightly tougher going as we were heading uphill – not super steep, but noticeable. There was a KOA right down the road from the trailhead so we stopped there to check it out. I went in and asked about a campsite. The man said “You can have a campsite if you really want, but I wouldn’t feel right about it. I rained like crazy for the last week straight! 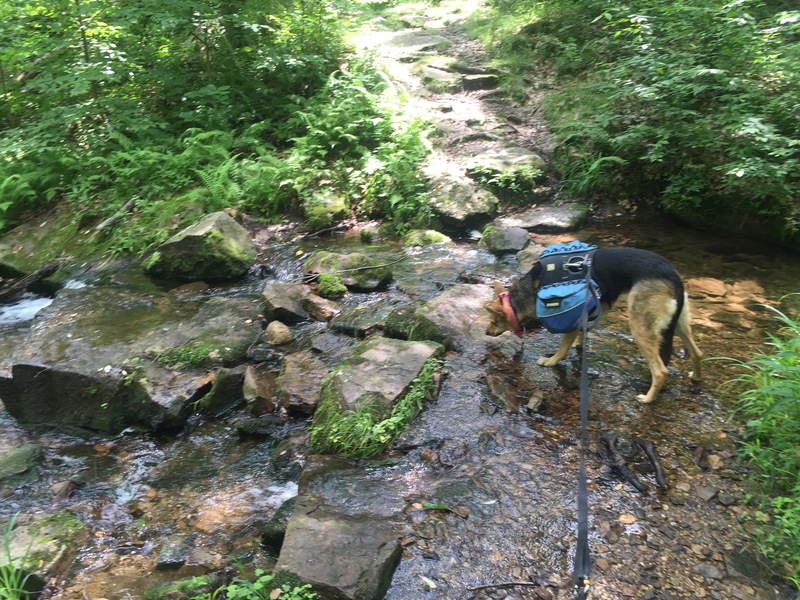 Everything is flooded around here – a cabin would be better.” Well I was SUPER glad we decided to not continue the Morrison Trail then – who knows how the rest of the trail would have been!! I decided to start the long drive home and see if we could find something less flooded. We drove for a few hours and I used the MapQuest APP to find camping along our route home. 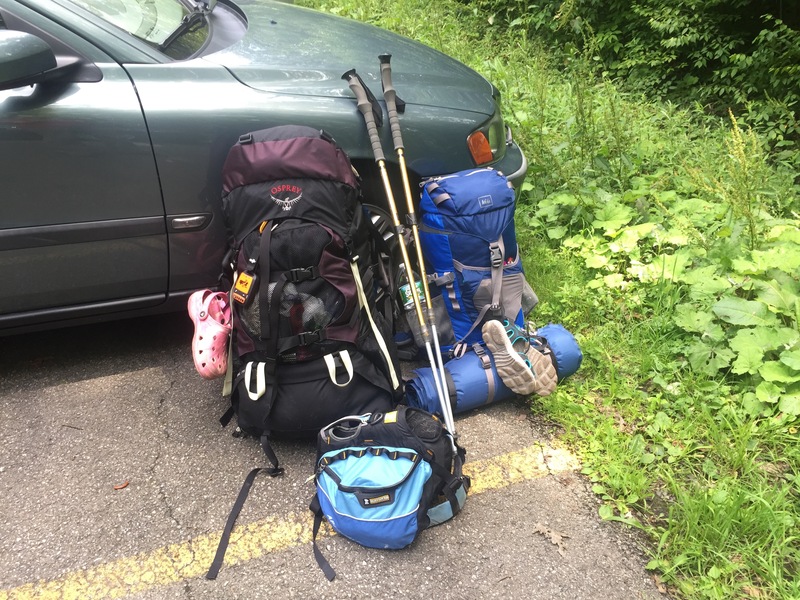 We pulled into Woodland Campground and I could NOT figure out where to park – there was a circular drive around the check-in area, but no designated parking spots. I drove around it a few times figuring I MUST be missing something- finally I gave up and just pulled over out of the way as much as possible. I went in to see if they had a campsite available. The staff was extremely friendly – they showed us to a tent site and warned us it was slightly muddy due to the rain, but it wasn’t bad. 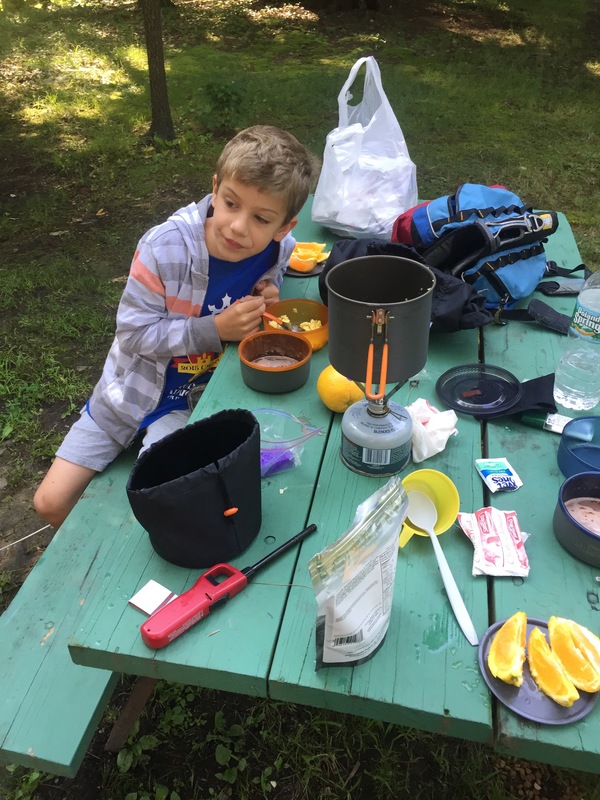 We set up the tent and made dinner – mac and cheese. After dinner we walked down to the check-in area which also had a laundry/ sink area to do dishes and bathrooms. This path was very muddy with a huge puddle that took up the width of the path. “Mud is the theme of our weekend! !” my nephew said. 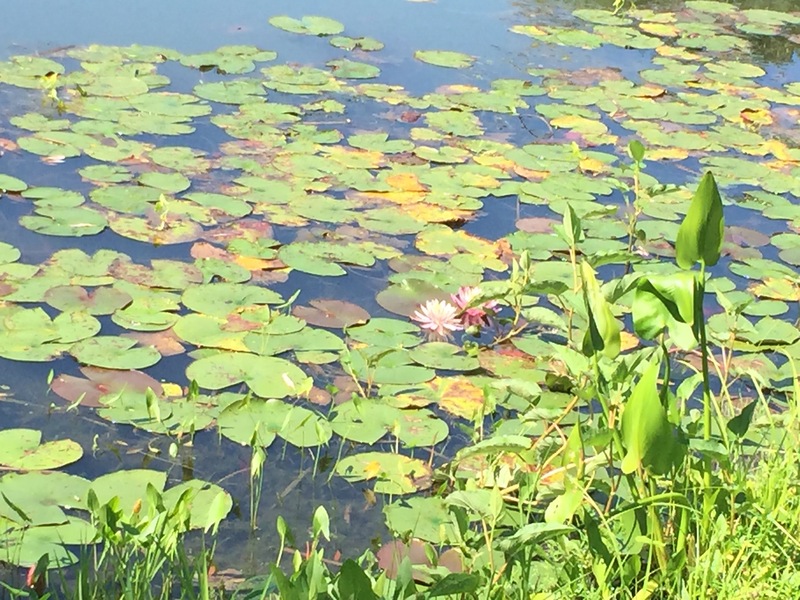 It sure was…. 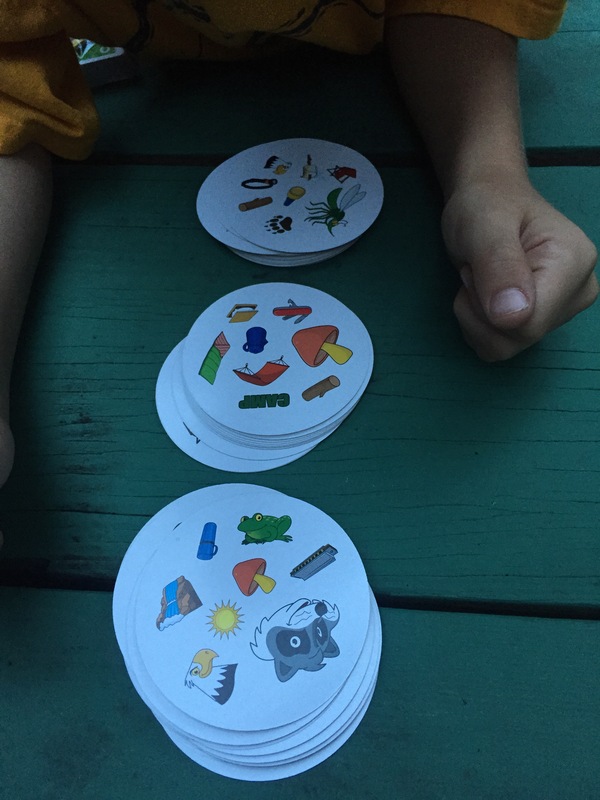 I brought a new game called SPOT IT – it was so much fun and we played a few rounds of it!! SPOT IT – camping version of course! We tried to get a fire started, but everything was too wet so we couldn’t get it lit even with a little fire starter log and all the newspaper they gave us with the wood we bought. 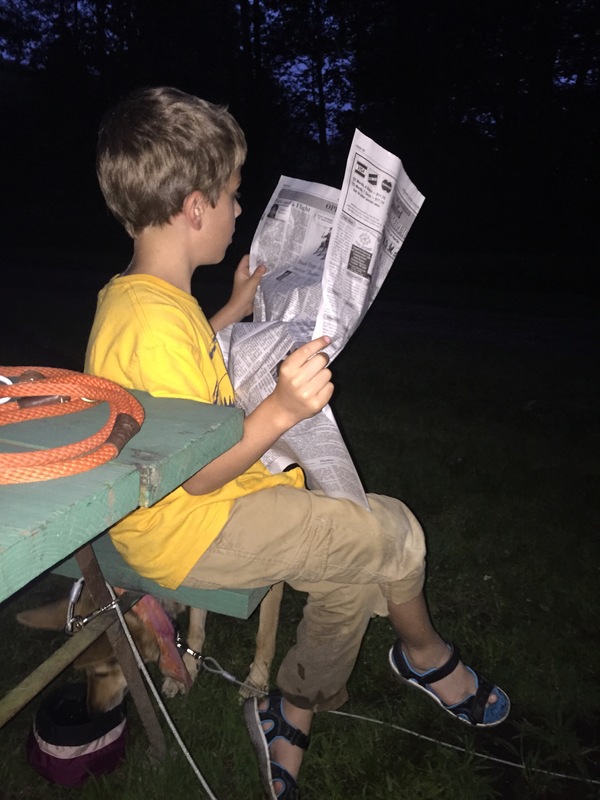 He wanted to read the paper before we threw it in the fire – this pic cracks me up! There was a cabin next to our campsite with a bunch of people sitting around drinking. This one guy kept looking over at us which started to make me a little nervous. At one point I hear Joey barking like crazy and look up to see the guy walking into our campsite holding something. “Can I give this to your dog?” he asks. “It’s a piece of bread with butter on it that fell on the ground.” “No thanks!” I say in a friendly but stern voice. “Why not?? It’s just bread- dogs can eat bread! !” “NO, thank you – she doesn’t eat people food.” I say a little more stern. He proceeded to argue with me until someone from his group said, “Leave them alone!” and he finally backed up. 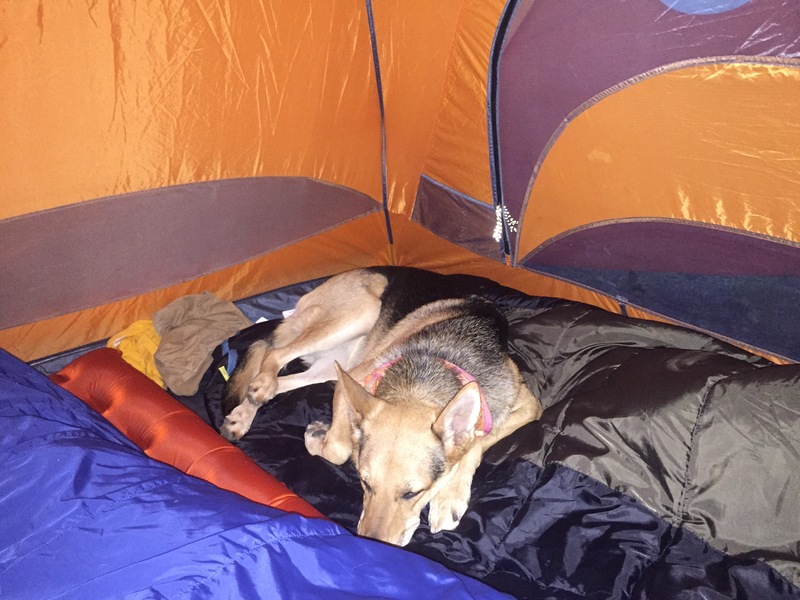 This was extremely unnerving to me – do NOT walk into someone you don’t know’s campsite and then argue with them when they tell you you can not feed their dog! SERIOUSLY! What is WRONG with people?? I kept thinking ‘please just leave us alone because I am super tired and do NOT want to leave! !’ I also didn’t want to have to explain to my nephew if we would have to pack up and leave quick- plus he would have been so disappointed! Luckily, they left us alone for the remainder of our stay. 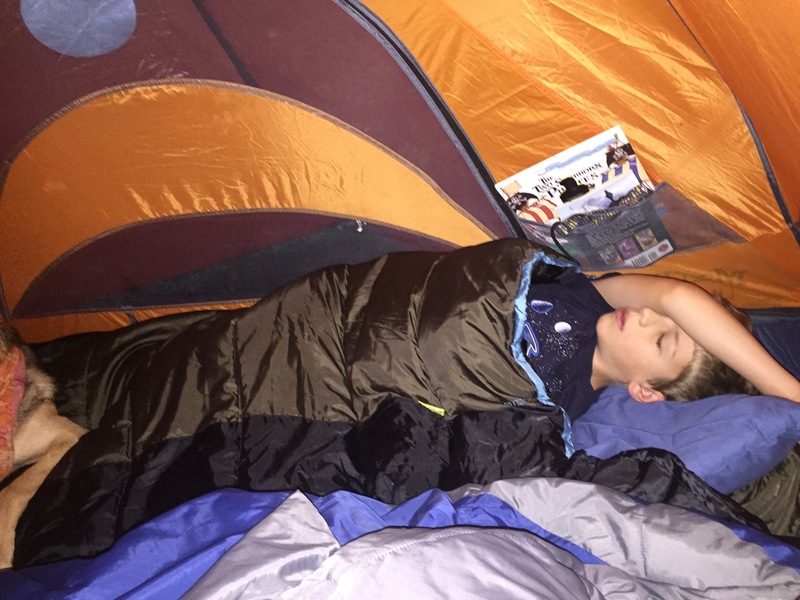 We crawled into the tent when it got dark, read a little and then passed out! In the morning we decided to drive to the bathrooms – I felt a little weird about this as it really wasn’t a far walk at all, but the huge puddle was still there and I didn’t feel like sloshing through that again. We had breakfast of eggs (I forgot the salt so they tasted a little bland!!) 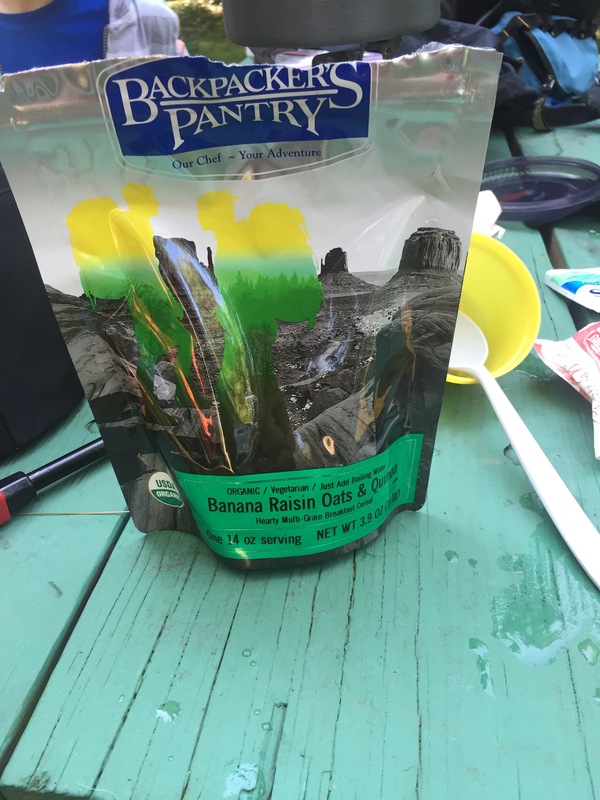 and I tried Backpackers Pantry Banana Raisins Oats & Quinoa which was EXCELLENT!! 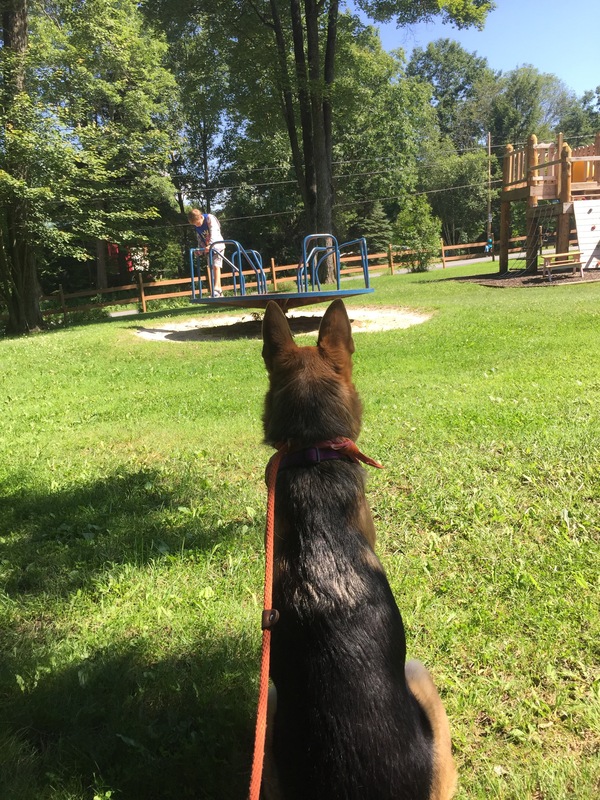 We then went to the playground that they had and then went for a hike around the lake. 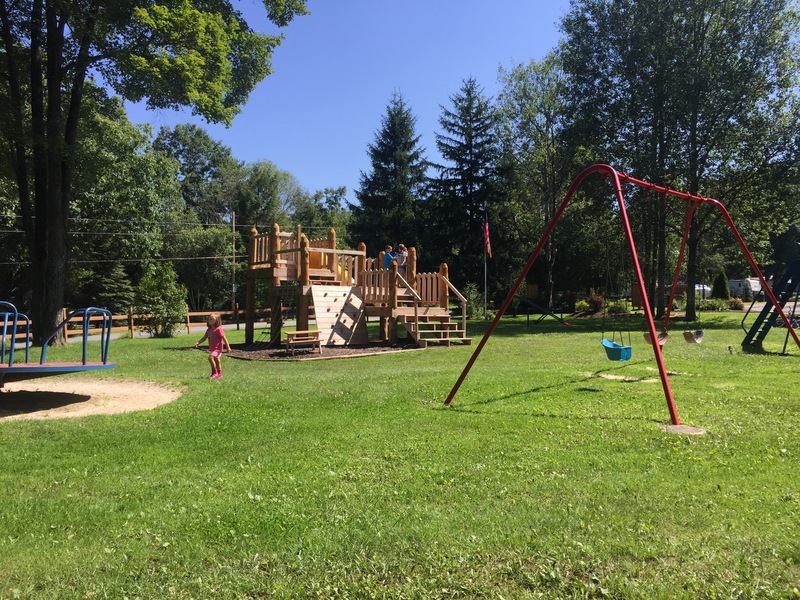 Honestly this campground was VERY nice and well taken care of – we had a great time! 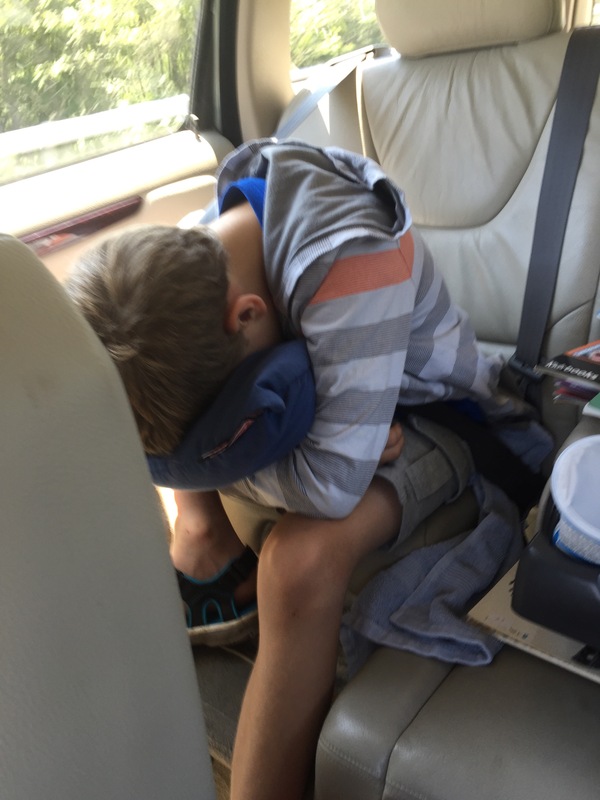 Then the LONG car ride home.